What is a genre cliché? A genre cliché is anything that’s been done so often in a particular genre that it’s fairly predictable. You don’t really need to explain it. It just is. Every genre has them, and so does every sub-genre. A few years ago, I was talking to a senior editor (not my own) from a major NY publisher during a conference luncheon. Somehow, we began talking about time travel romances and she said how tired she was of the same-old plot devices. She said that wished that just once someone would send her a manuscript in which the character made the choice to travel through time because every book she saw was about a person transported accidentally into the past. The point is that no matter what it is, if other writers have done it repeatedly, it’s probably a cliché. 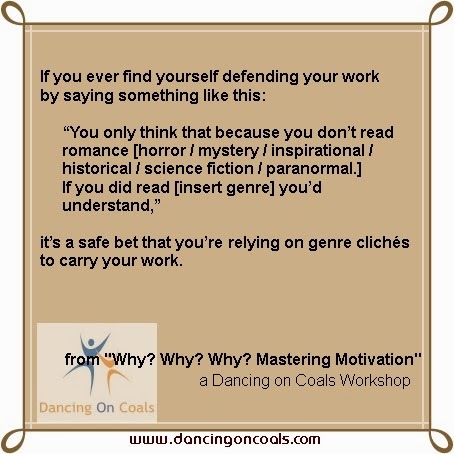 One quick way to find out if you’re writing with genre clichés is to hand your manuscript to someone who doesn’t read your particular genre, and then watch where she stops reading to ask you either how or why? Why did the heroine say that? How did he know this was a new planet? Why did the hero do that? How does she expect to find that? Why did he turn around and walk away? Why did she snap at him? How did she know to look there? Why did she make love to him? Why does he think he’s in love with her? That doesn’t mean you won’t get nods from undemanding readers who don’t notice that you’ve just had the character do or say something unbelievable. Some readers won’t care that yet another hero has just imagined the heroine lying in his bed, her hair spread out across the pillow. But most readers and editors these days are too well-read to miss the clichés. So you might want to ask yourself before you write that “Hero walks in on Heroine naked” scene just how often that really happens, how likely it is to really happen, and what you’re accomplishing by making it happen. Is it realistic and true to life, or is it the easiest way for you to show that the couple is sexually attracted to one another? This is not to say that those scenes don’t work on some level. They do. That’s why they’ve been rehashed so often they’re now clichéd. But they’re old and tired and predictable … and boring. Your job is to find new, unique, and realistic ways to accomplish the same thing.